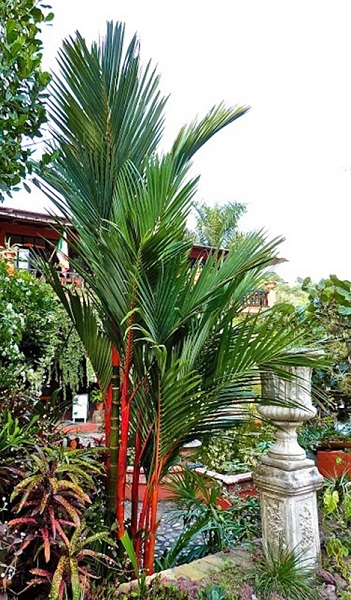 In the right location, the Lipstick Palm can be a most attractive houseplant. 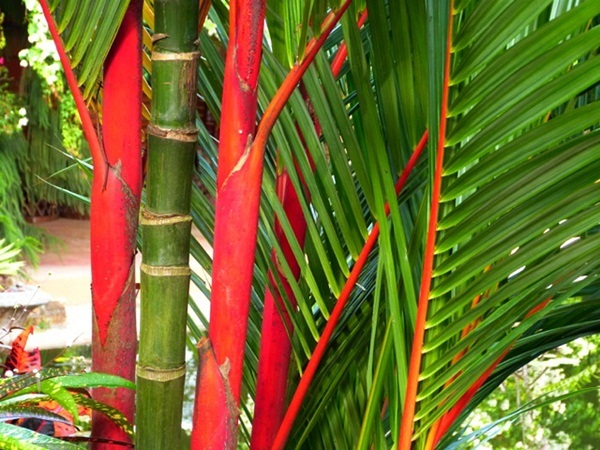 Above this palm’s graceful, slender gray to light brown trunks are eye-catching scarlet red to orange-red, three foot long, crown shafts. Simply glorious in appearance, these colors are among the rarest found in any palm trunks. This somewhat short palm is the proverbial “show stopping, eye popping, wowie-ka-zowie, looker”! Robert Lee Riffle – perhaps the most knowledgeable of all palm authorities – described them succinctly as “Exquisitely thin-trunked clustering feather palms” and in yet more glowing terms, “Never has nature been more profligate in lavishing beauty on a single plant.” From a guy who knew more about palms than any ten other botanists that some praise, huh? The genus consists of eight to nine varieties originating in the coastal swamps and lowland rain forests of Malaysia, Indonesia, Borneo, Sumatra, the Solomon Islands and Southern Thailand, living up to 80 years. In those wild environs, this exquisite palm can grow to a height exceeding thirty feet (nine plus meters) but as a domesticated palm, it generally grows to but half that height. Above the colorful crown shafts, its pinnate (feather shaped), green to light yellow-green, leaves, around four feet (1.2 m) long, are gracefully arched. Be aware, however, that this beauty does not care for drying winds, becoming damaged, and even killed, if the temperature drops below 40o Fahrenheit, and it handles drought very poorly. As regards this palm disliking cold, there are some who say that there is a fungus – Gliocadium – that may reside on it and which becomes active when the temperature drops below 70oF. Such being the case, it is recommended that a fungicide be applied late in November or December (even here in Mexico) – just in case. In addition to loving – make that “needing” – water and high humidity, it prefers direct sun. However, it can handle some shade though rich, moist, humusy, and well drained soil is a must. Inasmuch – it is written in some source books – as they grew naturally in swamps, they can even grow in standing water such as bogs and marshy land … though I’ve not had much luck with that approach! 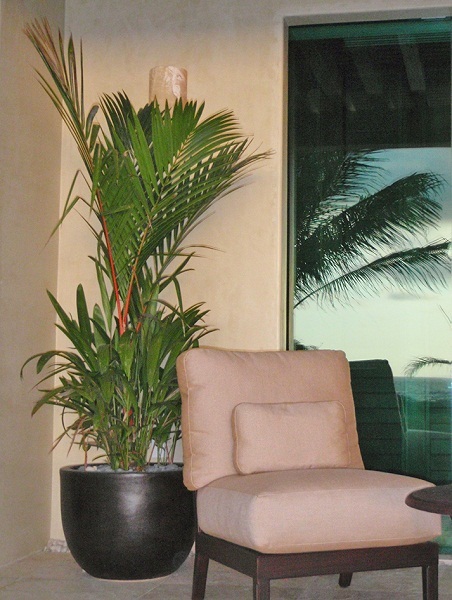 With a tendency to clump next to each other, it is similar to a Bamboo Palm and great for screening areas. They are also beautiful on patios and around swimming pools. It is a slow grower with young plants sometimes remaining but a few inches tall for up to three years. (Though such was not the case with ours which, initially, grew most profusely in our entry terrace.) But also take note, when they are younger, they are particularly attractive, losing allure with age … like us! It should receive monthly feedings of tropical plant food (we also regularly throw on dried cow manure) and is best propagated by carefully dividing the root clusters as its seeds are very slow to germinate, taking from three months to a year to do so. It has no major pest or disease problems. It is monoecios (or as some botanists describe it, hermaphroditic) which means that the pollen and ovules come from separate flowers on the same tree and pollinates itself – a bit boring – and lonely – way to reproduce, but it gets the job done! Because of their rarity and slow growing nature, they are generally a bit costly … but, as any who have seen these will attest, they’re well worth it!